Annapurna region offers the best experiences and adventures for those seeking for Trekking in Nepal. 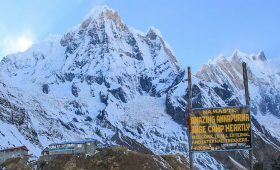 And the Annapurna Base Camp 7 days trek is one of the short yet, popular trekking trails in the Annapurna region. 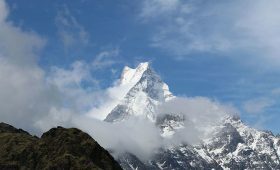 This trek is a great option for those who don’t have as much time but wish to experience the beauty of the mountains and hills of Nepal. ANd plan to walk through the quaint villages full of typical settlements. Annapurna Base Camp lies at an elevation of 4130m above the sea level. It stretches along with Lamjung Himal from the Kali Gandaki in the west and Marshyangdi in the east in the central north part of Nepal. This 7 days trek takes you through scenic villages, rich oak, pine and bamboo forest, and glacier which are uniquely beautiful. The short trek to Annapurna Base Camp also offers spectacular views of magnificent snowy peaks like Mt Annapurna, Dhaulagiri, Manaslu, Machhapuchhre and many more in lesser days. Ghandruk, Chomrong village, ABC and Jhinu( Natural hot spring) are the major attraction of this trek. These villages preseve the typical lifestyle of the Gurung and the Magar ethnicities. Taking this trek allows you to be close to nature and also experience their rich cultural heritage. Annapurna Base Camp trek is possible throughout the year but will be most interesting in Spring. As the whole forest along the trail turns red, pink and white with beautiful rhododendron flowers. For those who wish to go on a more adventurous trip in Annapurna region, we also have our 14 days Annapurna Base Camp trek as well. Magnificent view of sunrise and sunset from the Annapurna Base Camp. On day one, we have an option to either start from Kathmandu or Pokhara. The day starts early morning with 30 minutes flight from Kathmandu to Pokhara. You can also take a bus ride but that will take a longer time and can be quite hectic. 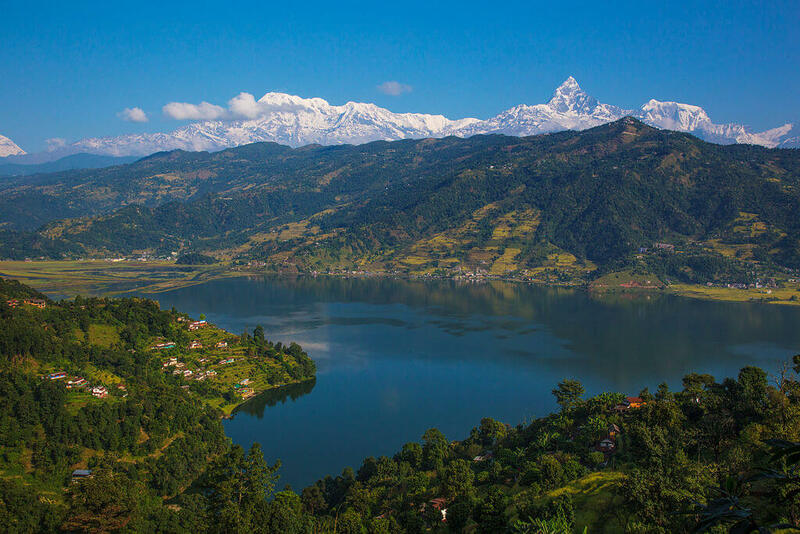 Pokhara also called the lake city is a beautiful holiday destination in Nepal with amazing mountain views from all sides. From Pokhara, you will take a bumpy ride to Nayapul which takes about one and half hour. Once you reach Nayapul you will take a quick rest and trek to Ghandruk. It takes around 5-6 hrs to reach Ghandruk from Nayapul with a distance of 9 km. Along the way, you will cross the suspension bridge to Birethanti. The trail starts at the bottom of the river valley and passes alongside the Modi khola and rice terraces. As soon as you leave Birethanti you will get a sprawling view of Mt.Machhapuchhre. Further, you will walk up to the base of Syauli Bazar followed by man-made stone trail to reach Kimche and finally to Ghandruk. Ghandruk is a large and prosperous Gurung village. 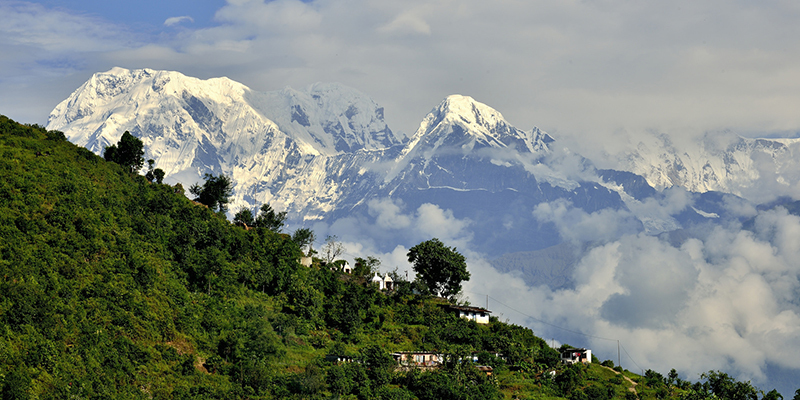 You will relax in this scenic village with amazing backdrop view of Annapurna South, Hiunchuli and Mt.Machhapuchhre. The remaining time you can explore Ghandruk village and Gurung museum. Overnight at a lodge in Ghandruk. Today after breakfast you will start your trek to Chomrong and further to Sinuwa. You will pass through a stretch of flat land followed by lots of downhill and slippery slopes. As you walk for about 3 hours you will reach Komrong Danda. From Komrong, you will trek down to Komrong Khola and then climb up to Chomrong which takes about 2 hrs. Chomrong is the biggest Gurung settlement and also the best place to get a brilliant view of Mt. Annapurna south and Hiunchuli and the virgin peak Mt.Machhapuchhre. Further, you will put your first step with a stone step to the river Chomrong and cross the river and hike to Sinuwa village. Overnight stay at a lodge in Sinuwa. In the morning after your breakfast, you will start your trek from Sinuwa to Deurali. The trail is mostly uphill and you will walk through the jungle. During your walk to Bamboo, you will realize why the place got its name. The forest is almost entirely made of bamboo trees and walking through it nothing less of an enjoyment. Further, you will pass through Dovan and Himalaya on the way. The trail to Deurali is very diverse in terms of landscapes. Annapurna and Machhapuchhre follow you everywhere while walking through other part of the bamboo forest. And then a bare, rocky and steep trail will leave you to your final approach for the day ie to Deurali. Overnight stay at Lodge in Deurali. Today is the day where you head towards your final destination and goal, that is the Annapurna Base camp. By this trek starting from Deurali the forest will be completely gone. 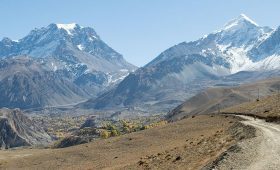 And you will walk through a breathtaking high altitude river valley with the view of Annapurna right ahead of you. At Machhapuchhre Base Camp, you will stop for lunch and get some rest. The trek, further, will offer views that keeps getting better. From here you will see big snowy uphill that almost looks like a glacier. Once you climb that you will see ABC peeking from the distance. The last part of the trail will be a true delight. Due to the excitement of reaching your goal, you will completely overlook the exhaustion. You will spend time clicking amazing pictures in the Annapurna Base Camp. If the weather is nice you will get a nice sunset view from here. Overnight stay at a lodge. Today you will wake up early in the morning to witness blazing sunrise. And the view of Annapurna I, Barahi Shikhar, Tent peak, Annapurna south, Himchuli and Gandharva Chuli is spectacular. After the sunrise view, you will be back to the hotel for breakfast. Later you will start your trek from Annapurna Base Camp to Bamboo. The trail is the same as you came and you will pass via MBC, Deurali, Himalaya, and Dovan. Once you reach all the way down to bamboo you will take rest and stay overnight at a lodge. As always, after breakfast, you will start your trek from Bamboo to Jhinu Danda. You will pass via Sinuwa and Chomrong village. Jhinu is at an elevation of 1690m. The trail to reach Jhinu is full of ups and downs along the stone stairs. In the afternoon, you can enjoy the natural hot spring in the banks of the Modi River. Here you also have the option of continuing to Kyumi if your trek is from Kathmandu to Kathmandu. Overnight at a lodge inJhinu Danda. Today’s trek takes 3-4 hrs from Jhinu to Siwai. Further, from Siwai, you will drive to Pokhara that will take about 3 hrs. And overnight stay at a hotel in Pokhara. Or, you can trek up to Siwai. And then drive to Pokhara airport directly to Kathmandu city where you will spend the night at a hotel in Kathmandu. You can rent the expensive gears instead of buying them if they are of no use in the future. Opt for off-season if you are someone who enjoys the peace and lesser crowd. Do not rush and do take rest in between while trekking. Stay hydrated and drink plenty of water to minimize the risk of altitude sickness. Carry enough cash with you during the trek as there are no ATMs on the trails. Do not show public display affection which turns out disrespectful among the locals. Take proper precautions against AMS/altitude sickness. 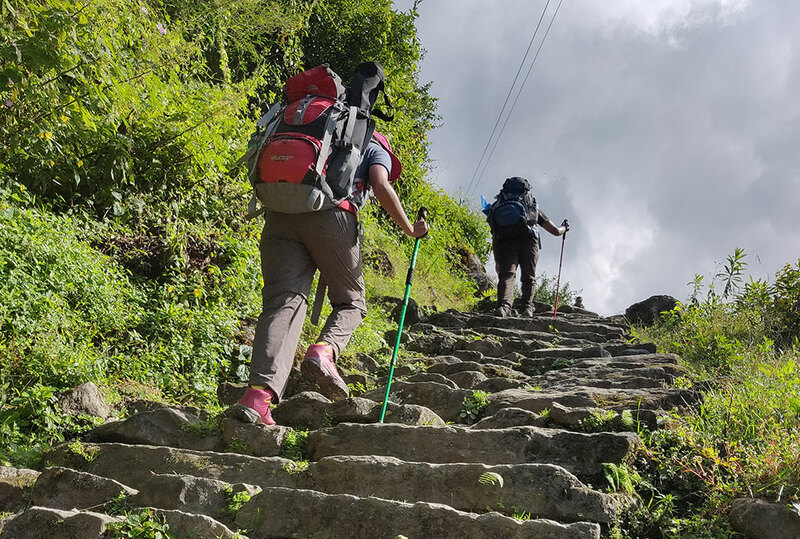 The 7 day Annapurna Base Camp trek is a quick and best way to reach the base of Annapurna within a short period of time. Despite the short length, there is no compromise on the experience and the adventure that this trek has to offer. With a little bit of preparation prior to the trek, anyone is capable of taking this trek because of its moderate grade. We are flexible with the itinerary and can work to suit your preference. Hence for further question and queries, please feel free to contact us. It is our pleasure to guide and assist you with the best of our knowledge. 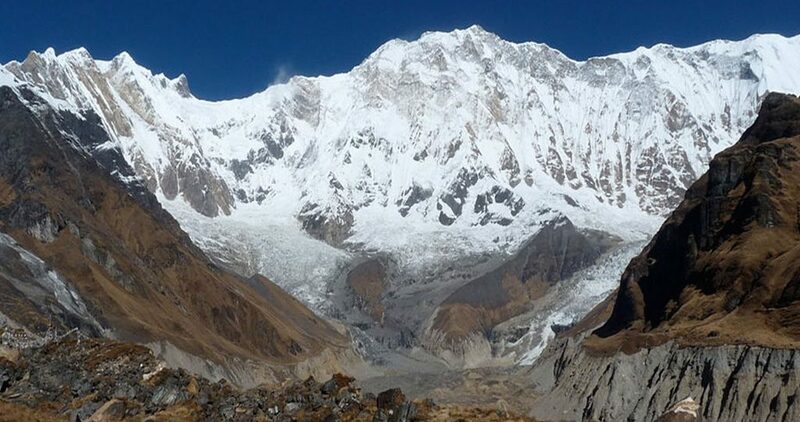 QNo.1 How difficult is Annapurna Base Camp Trek? 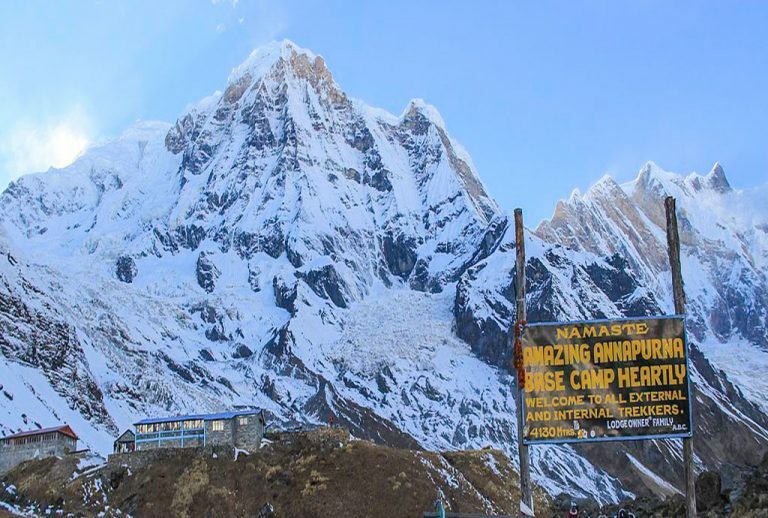 Annapurna Base Camp trek is a moderate trek that doesn’t demand a high fitness level. The highest elevation you will reach is 4130m. Hence trekkers having previous trekking experience with a fit body can complete this trek within a short period of time. With proper preparation even a novice trekker can opt for this trek. QNo.2 When is the best time to trek? ABC trek is possible all year round. However, from mid-September to November (autumn) and March to May (spring) are the best seasons to trek to Annapurna Base Camp. June to August (monsoon) is the rainy months. While the hike, it offers grand spectacles of blooming rhododendron flowers during the month of March, April, and May. If you would like to avoid crowd then it is best to trek in winter (December – February). The temperature is cold in the morning and night but not unbearable and it is warm during day hikes. Also, the sky is clear with a fantastic view most of the days. QNo.3 How much does ABC trek cost? Annapurna Base Camp Trek cost approx USD 550 excluding the flight cost. This is a standard trek price which is budget friendly. Of course, the price will vary according to group size, standard or deluxe tour plan and the duration of the trek. Also, taking a flight to and from Pokhara saves your time but at the same time increases your expense. The cost of a flight is around USD 125 for foreigners. While taking a bus ride reduces the trip expense. It would cost from USD 15- 25 per person. If you hire a guide the cost will be approx USD 25 to 30 while hiring a porter would cost slightly lesser i.e USD 15-20. Other miscellaneous cost includes hot shower bucket, charging gadgets and using wifi that would cost around USD 5 in total per day. QNo.4 Is there internet and wifi available on the trek? Yes, internet and wifi are available on the trek. But you have to pay a couple of dollars to use wifi. Also, make sure to buy a local sim card either Ncell or NTC before you leave KTM or Pokhara. You can fill mobile balance and do an internet recharge out of it. QNo.5 Is there a bank or ATM’s in the trek? No there are no bank and ATMs during the trek. So it is important to withdraw Nepali currency while in Pokhara or Kathmandu. QNo.6 How is the drinking water facility? There are natural springs along the way. You can carry water purifying table to make the spring water drinkable. You can either use a purifying tablet or refill boiled filter water from the tea houses with an extra cost.